We’ve got you covered with this electric blanket primer, including several recommendations for smart buys on the market today. What Makes a Great Electric Blanket? Electric blankets come in a host of different sizes, so think about how and where you’ll want to use yours. If you want to snuggle up on the couch while reading or streaming television, a throw-sized model might suit your needs. If you’ll be sleeping under it every night, you’ll probably want one the same size as your bed. 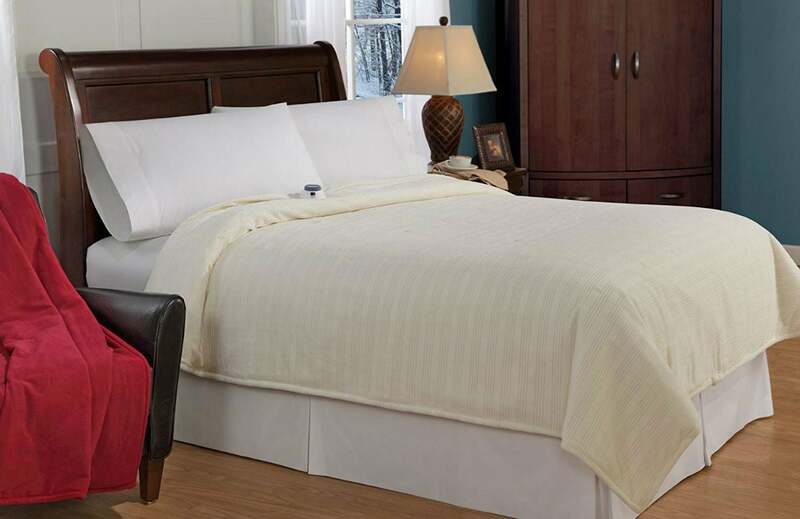 Fortunately, electric blankets are available in California King, King, Queen, Full, and Twin, as well as smaller sizes similar to a typical throw. There’s a wide assortment of solid colors and various patterns from which to choose. While some have a quilted texture and others do not, electric blankets are usually very soft to the touch, made of fleece or microfiber (i.e., polyester). Depending on the manufacturer and features, they range in price from under $50 to upwards of $300. Originally called “heated quilts” or “warming pads” and around since the early 1900s for use in hospitals, electric blankets first became popular for home use in the 1950s. They’ve haven’t changed all that much since then, but they do have features worth considering! Heat settings. 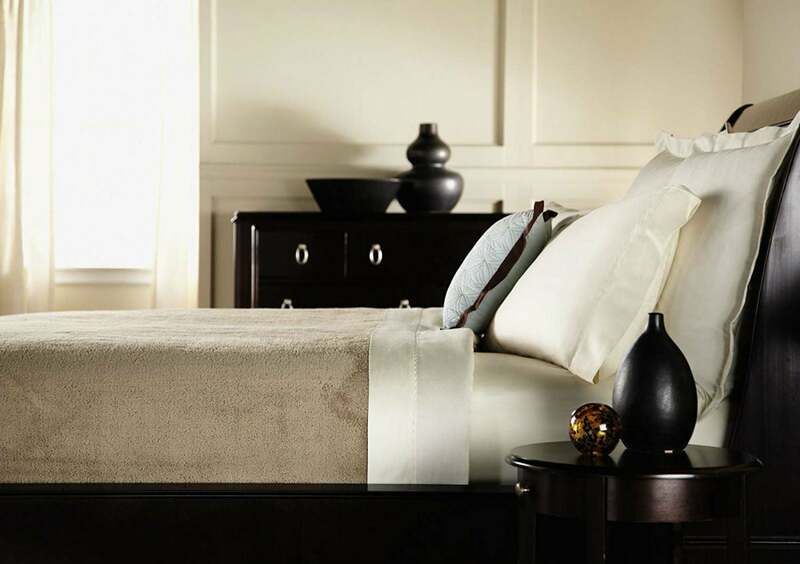 Many electric blankets have up to 10 heat settings so you’re sure to find the temperature that feels best to you. Automatic shutoff. This feature, which automatically cuts off the blanket’s heating mechanism after a specific time (usually eight to 10 hours), is an important safety feature that can keep you and your surroundings from overheating or even catching fire. It comes standard in most modern products, but do double-check to make sure. Separate controls. If you’re sharing your blanket with a loved one who likes things warmer or cooler than you do, opt for a blanket with two zones, each with its own separate controls. Instructions for machine washing. Many electric blankets can be cleaned and dried in your home’s laundry machines. Just be sure to use the specified washer/dryer settings and follow the manufacturer’s instructions to the letter (which always include untethering all remotes, cords, and peripherals, among other safety precautions). Although it feels like a soft, simple textile, an electric blanket is actually an appliance and should be treated as such. Especially if you’re investing a few extra bucks on super-soft material or extra features, make sure your blanket comes with a refund or replacement warranty. Safety is of utmost importance when using an electric blanket, so, again, be sure to follow all the manufacturer’s instructions to a T from the first use to the last. There are also two crucial rules to remember: Keep the blanket as flat as possible to avoid pockets of excessive heat buildup (especially when using higher settings) and never lay objects like books or cell phones on top of or underneath your blanket. It’s too easy for your belongings to trap heat between themselves and the blanket, causing the blanket’s coils to overheat—which could destroy them or burn everything around them. To help you find the best electric blanket and warmth all season long, we’ve picked favorites based on the considerations outlined above and high-scoring reviews from shoppers like you. Scoring 4 out of 5 stars from Amazon customers, this microplush velvet electric blanket deserves a spot on your sofa for its ability to deliver consistent heat and automatically shut off after three hours of lounging or napping. The built-in thermal system senses and adjusts the heat level throughout the blanket to keep you warm—but not too warm—all over. You can control how toasty the throw blanket (50 by 60 inches in size) gets by selecting from three heat settings on the ergonomically-designed remote and throw it into the washer and dryer with use. It comes with a five-year limited warranty. Made of eight-millimeter-thick Loftec polyester, Sunbeam’s most plush electric blanket for full- to king-sized beds is here to replace the layers of extra blankets you might have used to keep warm at night. Its thermal system delivers uniform heat at one of 10 heat settings you can control via remote. And, if you wear the blanket overnight, it will automatically shut off after 10 hours to prevent overheating. Amazon customers, who gave it 4.1 out of 5 Stars, loved that you “really can’t feel the wires in it” and it “preheats on those cold nights.” It comes with a five-year limited warranty. There’s no need to fight over the remote when you buy this large, 4.4-out-of-5-star-rated electric blanket. The queen and king sizes feature two digital controllers so that you and your other half can each find personalized comfort at one of the 10 possible heat settings. 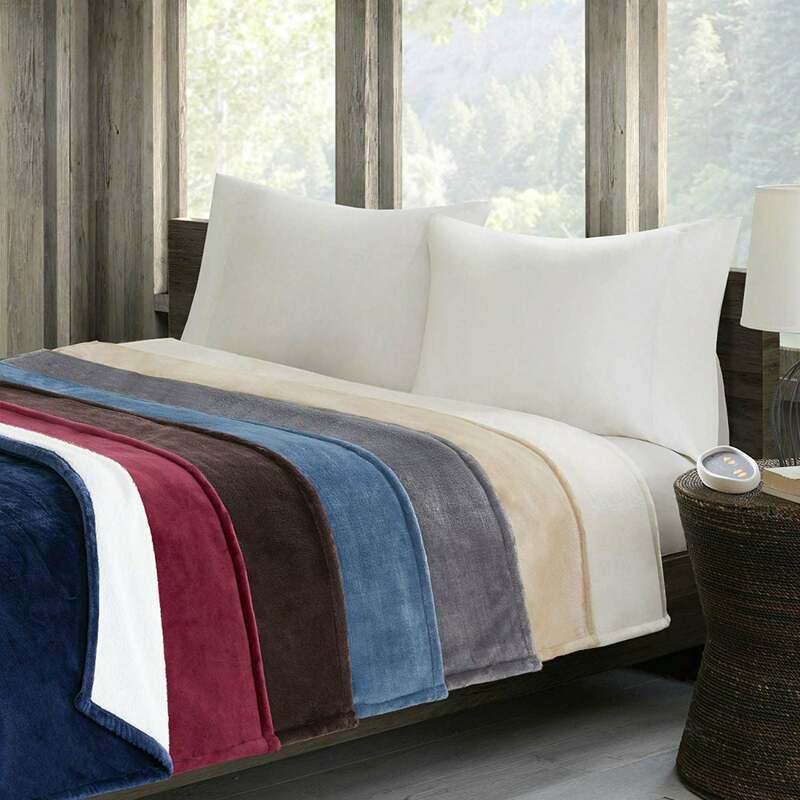 Speaking of comfort, this reversible blanket has it all: a plush microfiber top and a soft sherpa underside. And you can feel good about safely leaving it on overnight, too, thanks to a 10-hour automatic shut-off. It comes with a five-year limited warranty. 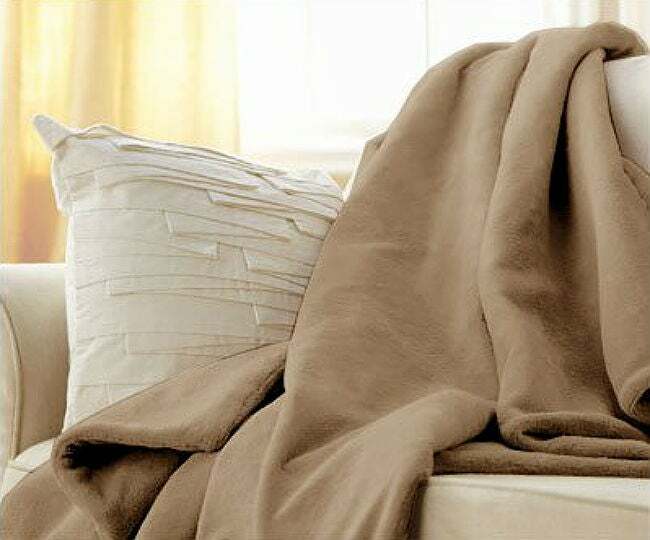 Bundle up without restricting the movement of your arms in this poncho-style electric blanket measuring 50 by 64 inches. Rated 4.2 out of 5 Stars by Amazon customers, this heated wrap (available in a variety of solid colors and patterns) will cloak you in the comfort of plush polyester with a micro berber lining. Switch between the three heat settings on the remote control, and the heat will automatically shut off after two hours as a safety precaution. It comes with a five-year limited warranty. Sensitive sleepers can find precisely the temperature they need to nod off thanks to this electric blanket, which offers 20 heat settings and dual controllers on the queen- and king-sized models. 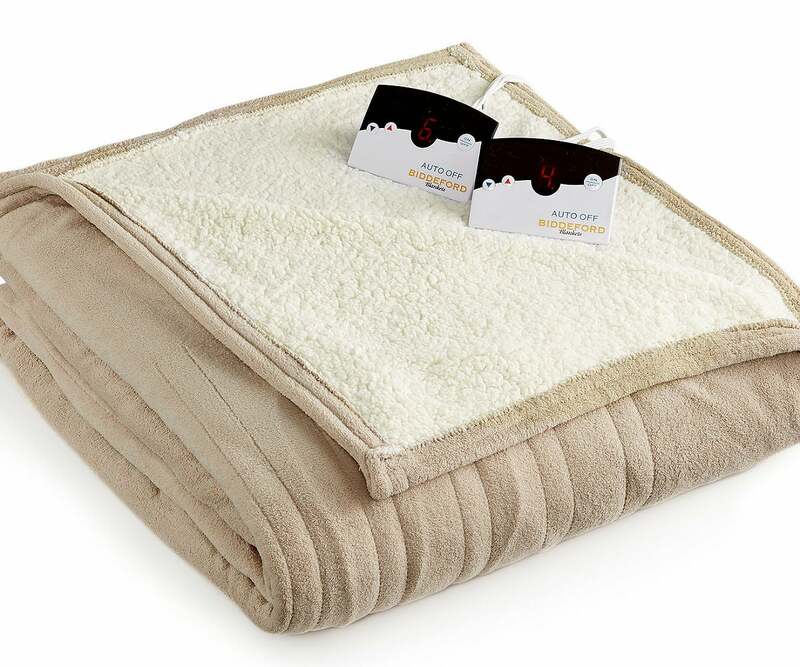 Available in twin to king sizes and seven colors, this reversible blanket with its microplush top and sherpa underside will warm you even when the heat is off. And, during use, the 4.2-star-rated electric blanket’s flexible internal wires are barely detectable. 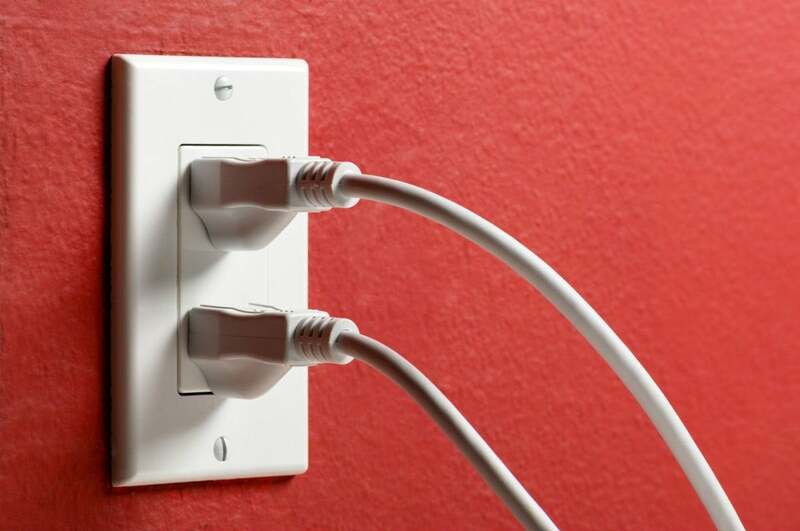 Rely on the 10-hour auto shut-off feature to prevent overuse. It comes with a five-year product warranty. 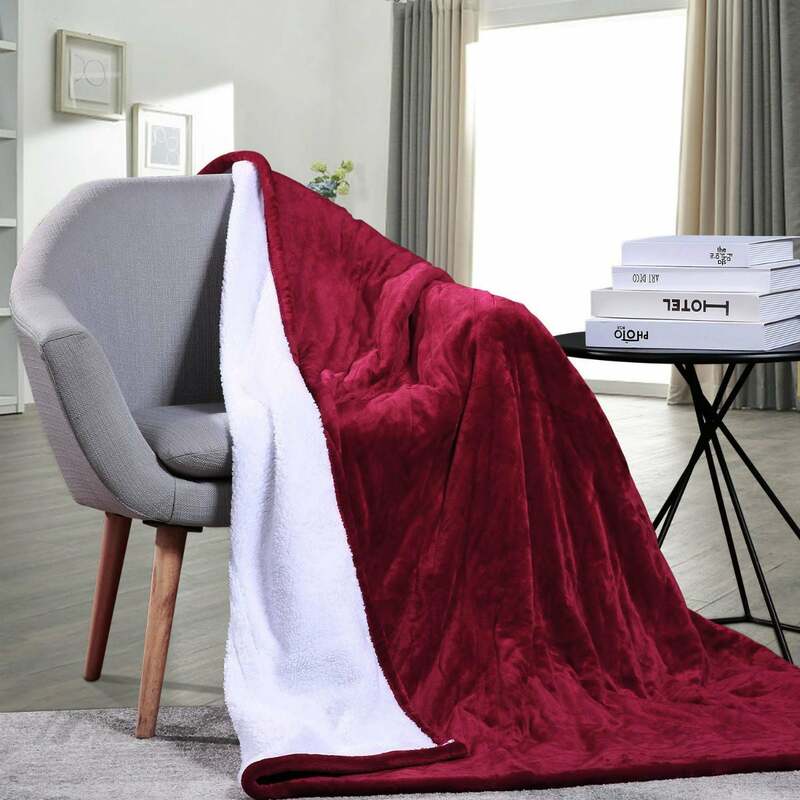 While most electric blankets leave your fingers and toes exposed, this 50-by-62-inch microplush throw blanket keeps extremities warm under wraps in two large built-in pockets for the hands and feet. Extra heat concentrates near the base of the blanket to keep your toes even toastier. But it scored 4.4 out of 5 stars on Amazon because it also offers excellent all-over warmth through three remote-controlled heat settings and offers a three-hour automatic shut-off feature to keep you safe and protect your investment. When you need heat in a hurry, count on this rapid-warming electric blanket to deliver full-body warmth fast. 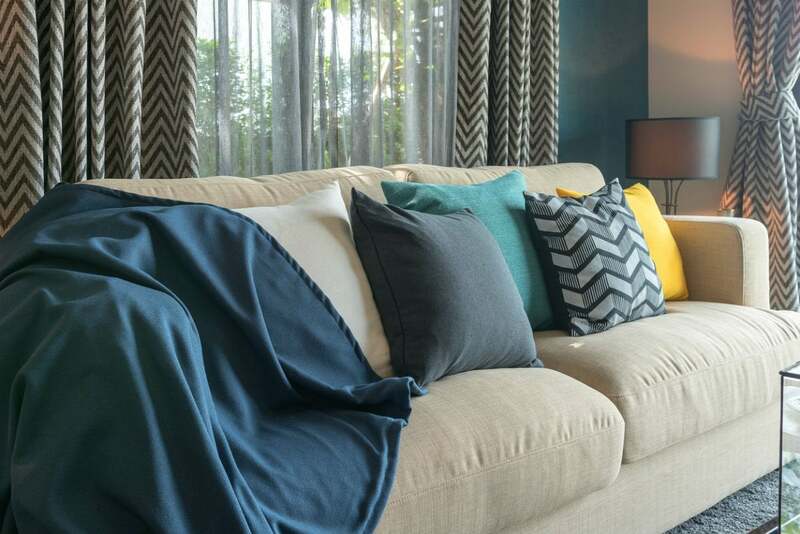 Three remote-controlled heat settings of the blanket let you adjust the warmth to your preferred temperature between 95 and 113 degrees Fahrenheit, plus, the automatic shut-off feature means that forgotten manual shut-offs are never a problem. 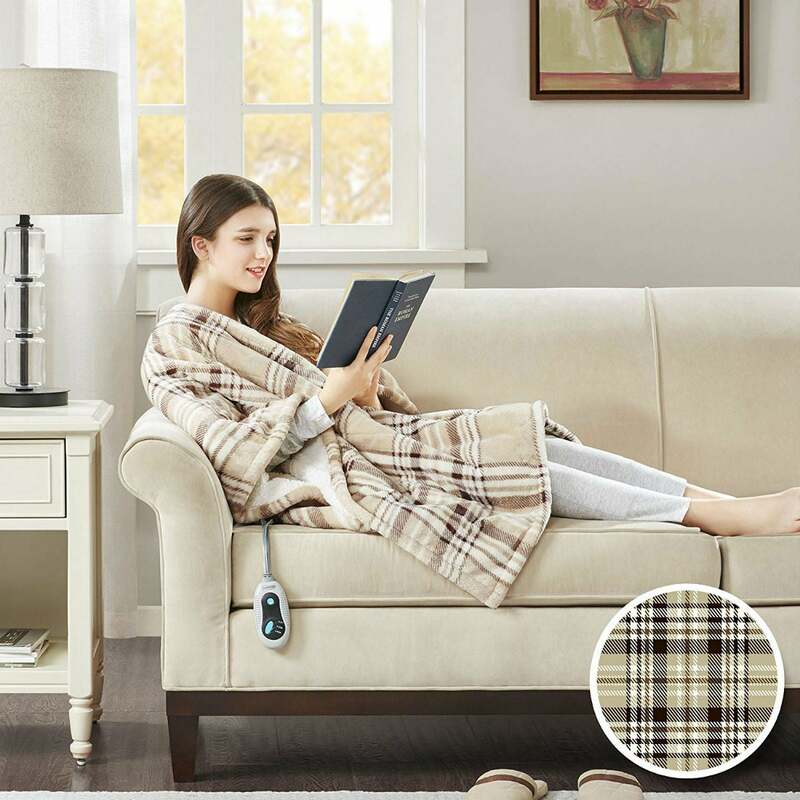 The detachable remote means you can use it as a normal blanket for even longer than its useful life. (Its silky flannel top and velveteen sherpa underside preserve the heat generated to maximize your comfort.) Rated 4.3 out 5 stars on Amazon, this blanket comes in throw, twin, and full sizes. Warranty information provided by the manufacturer upon request. Those who use electric blankets daily during winter should consider this low-voltage option that keeps you warm without spiking your energy bills. Rated 4.1 out of 5 stars on Amazon, the microplush blanket (available in twin and full sizes) boasts a triple-ribbed top that feels soft against skin and ultra-thin wires that even sensitive sleepers won’t notice. With options to pre-heat and automatically shut off at 10 hours, you’re guaranteed to slip into a toasty bed every night without overheating. Warranty information provided by the manufacturer upon request. Additional reporting by Amy Lynch.